On January 23rd, very early in the morning, our mother left this earth and arrived home in Heaven. We would like to think she had been thinking about this recently; just as we long for our own bed after being away for too long. Mom had her daughter, Sherry, at her bedside. Sherry was holding her hand and talking to her gently as she transitioned. Mom was always most complete when all of her family was together and Sherry being home gave her the peace to go. Sharlyn Sue Martin was born on December 18, 1945. We had recently celebrated her 73rd birthday. Earl and Bessie Martin were her parents and she had one sister, Janith along with six brothers: Gene, Jack, Steve, Roger, Dave and Reggie. Her sister and brothers were always very important to her and she loved them all dearly. We were blessed to grow up with wonderful uncles and aunt Jan, and their spouses who were equally wonderful. We look up to them; they are our heroes. We know stories from when they were kids and we have stories of our own to pass on. These uncles and aunts have provided us with many awesome cousins. Our mix of family, in-laws, out-laws and who knows what have been a source of love and acceptance for us. We are very thankful. We grew up in a variety of houses, in a variety of places, and got to know many wonderful people as a result. Neighbors became friends, friends became family and our family continued to grow and still does. Mom made every house a home and she always welcomed people into our lives who on the outside might have seemed not to fit, but were welcomed with open arms into our family. Last names never mattered. We all learned how to twirl a baton, cook, sew, be tough and resilient, and to love others because of mom. We grew up with the poetry of James Whitcomb Riley, the love of a good book, and a library card because of mom. We all have a good sense of humor and love to laugh because mom brought humor into our home; she was funny. When mom began having grandchildren and great-grandchildren she gathered them into the flock and loved them well. Candace, Cameron, Keenan, Aaron, Allison, Josiah, Noah, Logan, Camden, Colton, Regan, Maryn, Alex, Owen, John, Rhys, Jack, Sophia and Scarlett. If you hear any of them say Gerta they are talking about mom. It’s a weird name for grandma, but fits our tradition of being a non-traditional family. 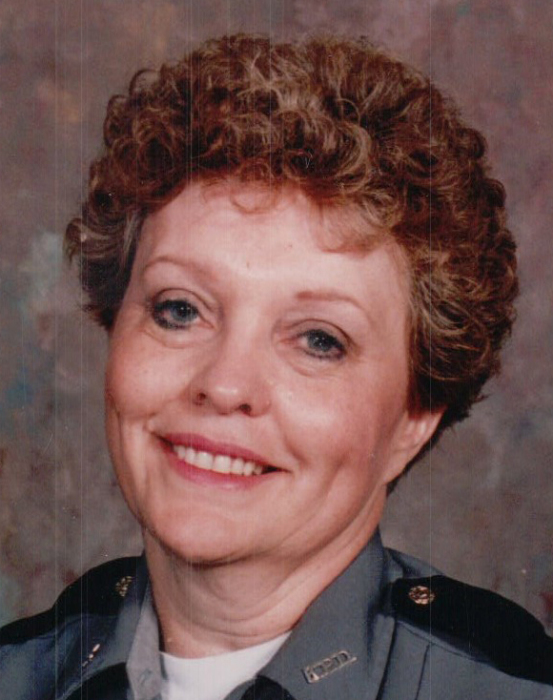 Mom worked at many places including Essex Wire and Delco, but her job at the Kokomo Police Department was a great source of pride for her as she was making a difference in the community. Mom loved Jesus and up until her last days on earth talked to Him and heard His voice even if only inside. She took us to church when it wasn’t easy and when being a single mom meant something different than it does today. She had neighborhood vacation bible schools at our house on Briar Court for the neighbor kids. Mom’s bible is well worn and well used. Underlined passages and hand written notes tell the story of a relationship with Jesus that goes beyond ink on a page. Mom is known for serving the hearing impaired community by learning and teaching sign language. She was a difference making volunteer at Morning Star Church for years. She interpreted spoken word and songs into beautiful unheard motions so that everyone could be included. She did this for others in the court system and community as well. She gave a voice and ears to those who had none. Terry Wray, Ted Sprinkle, Bud Kearnes, Dyrl Martin and Charlie Trine were all a part of her life at different times. Each added something positive even if it was us learning something about ourselves. Because of these relationships, there are people in our lives now that otherwise wouldn’t be, and for that we are thankful. Thanks dads. Mom put the fun in dysfunctional. We are a crazy and motley crew. Explaining our family has never been easy, but also something we have never been ashamed of. We are who we are and mom stood at the top of this tribe. If you are reading this and think you are or might be a member of this family, c’mon in. We accept you. Another last name is welcome. Our family tree is more of a rosebush. It is twisted and thorny at times but always beautiful when it is in bloom. We love you mom and will miss you greatly. We are who we are because of you, and your legacy of loving and accepting people will continue for generations. Sharlyn was a survivor. She lives on even in death because of who she was in life. On Sunday January 27th at Morning Star Church in Kokomo, IN we will honor mom with a visitation time from 3pm - 5pm with a Celebration of Life service at 5pm. Please join us if you are able to laugh, love and hug as we celebrate mom’s life. Those wishing to honor her life can make a donation in her name directly to the Kokomo Howard County Public Library. Love - Terry, Stacy, Kevin, Kim, Chris, Susie, Sherry, Ryan, Jeff and Tammy.